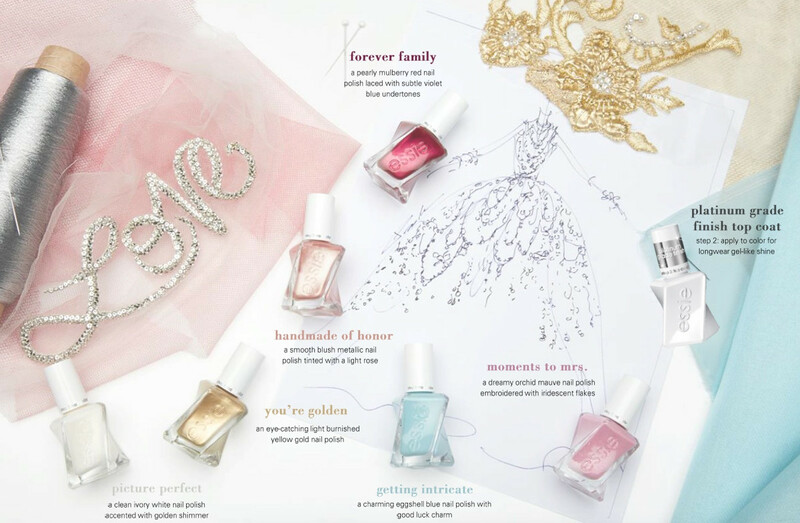 Luxurious red-carpet-ready bride-day shades – and the return of an anti-theft device. Hallo everybody! 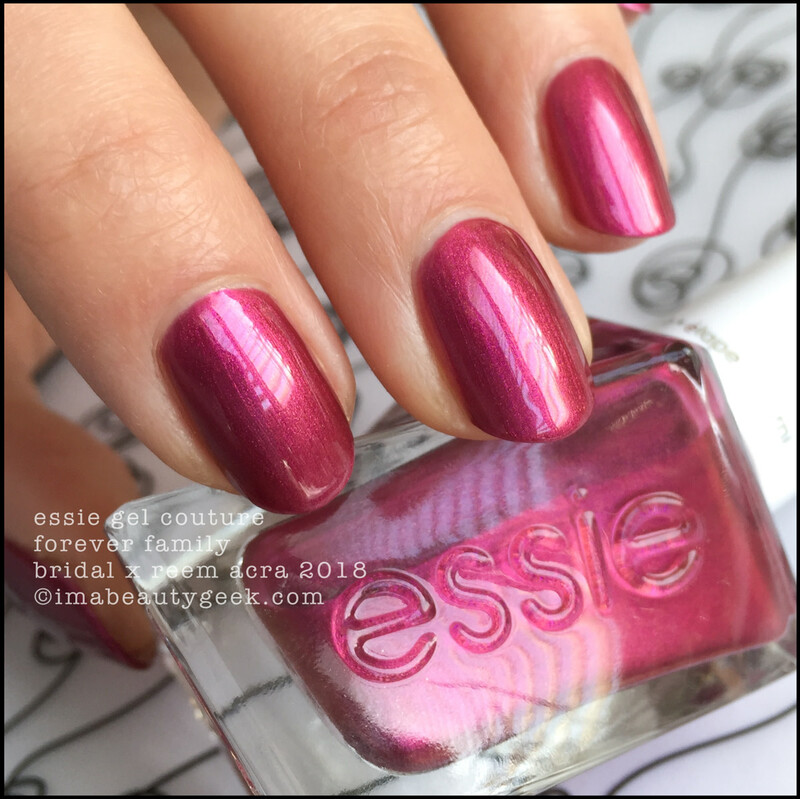 Today, a return to mah squiggles with the Essie Wedding x Reem Acra 2018 Gel Couture Collection swatches & review! 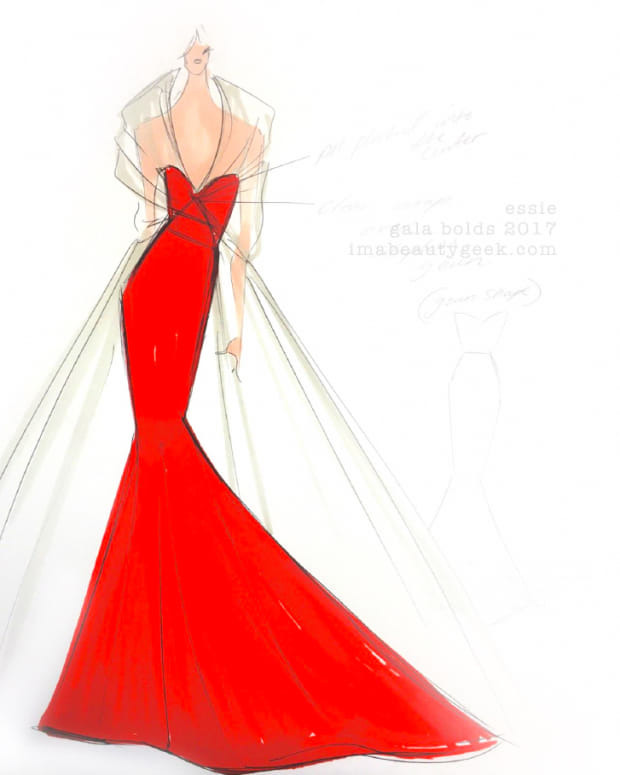 Don’t know who Reem Acra is? Not to worry – I didn’t either. Apparently, she’s an internationally renowned designer of richly-hued and luxuriously embellished couture red-carpet and wedding gowns. If you ask me though, she’s the creator of a fab nail little polish collection. If you’ve been with me for a while, you’ll have seen the following photo background before – you may (or may not) have missed it. Why is it back? Well that’s because these squiggles serve as my anti-theft device. Ya’ll see unauthorized use of mah hugely recognizable squiggles, and I get links in my inboxes! Seriously, you guys are The Best. I appreciate every single one of you who has alerted me to image thieves. Thank you. I mean it! 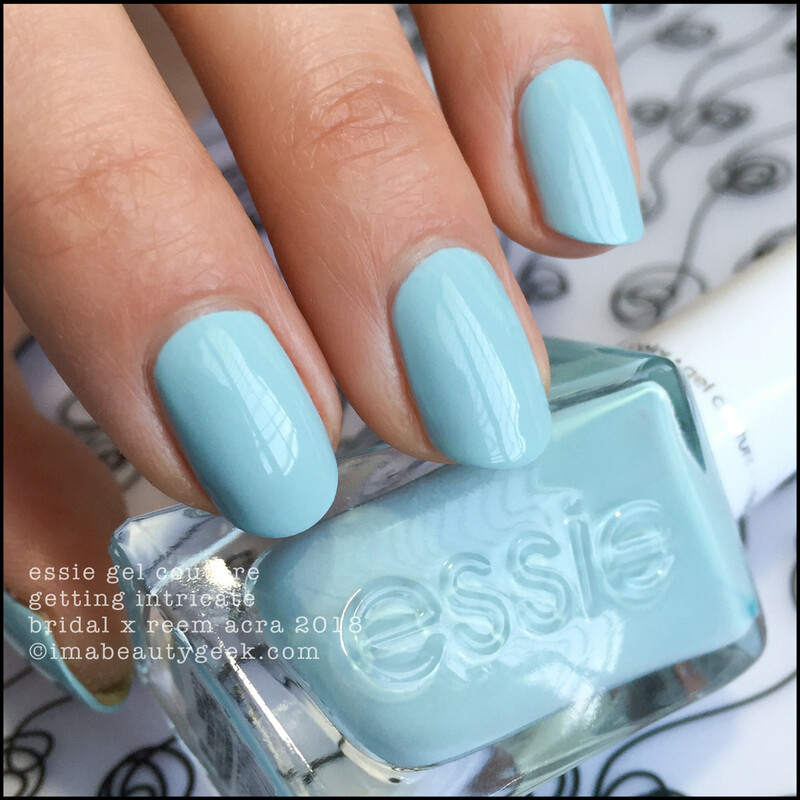 Essie Picture Perfect Gel Couture – Essie Bridal 2018 (above). I know it looks like a whole bunch of nuthin’ but it isn’t. There are tiny little golden flecks in here that, on a sunny day, catch the light. It’s a simple and beautifully clean look with a little extra embellishment; I quite like it. Can you build it? Sure. Should you? Nope. With successive coats, it just gets milky and streaky. I know this because I built it and it looked like crap. 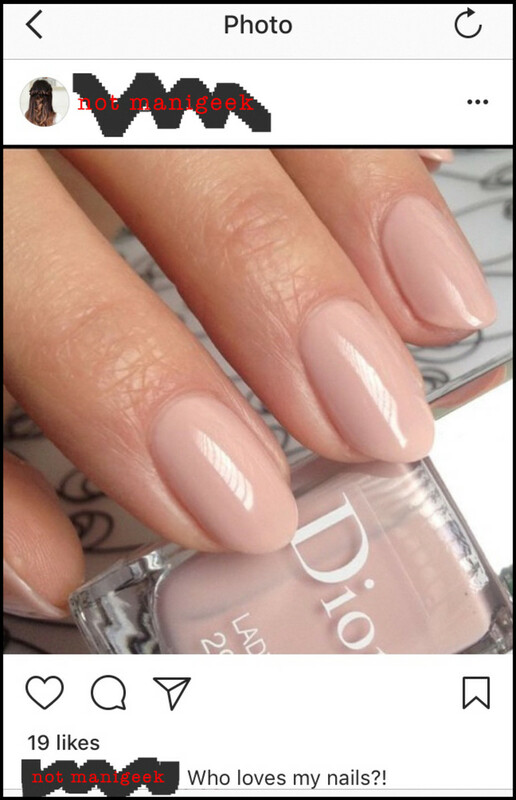 What you CAN do is use it as a top coat over pale shades that have lots of white in ‘em. It’s a tiny hit of sparkles! 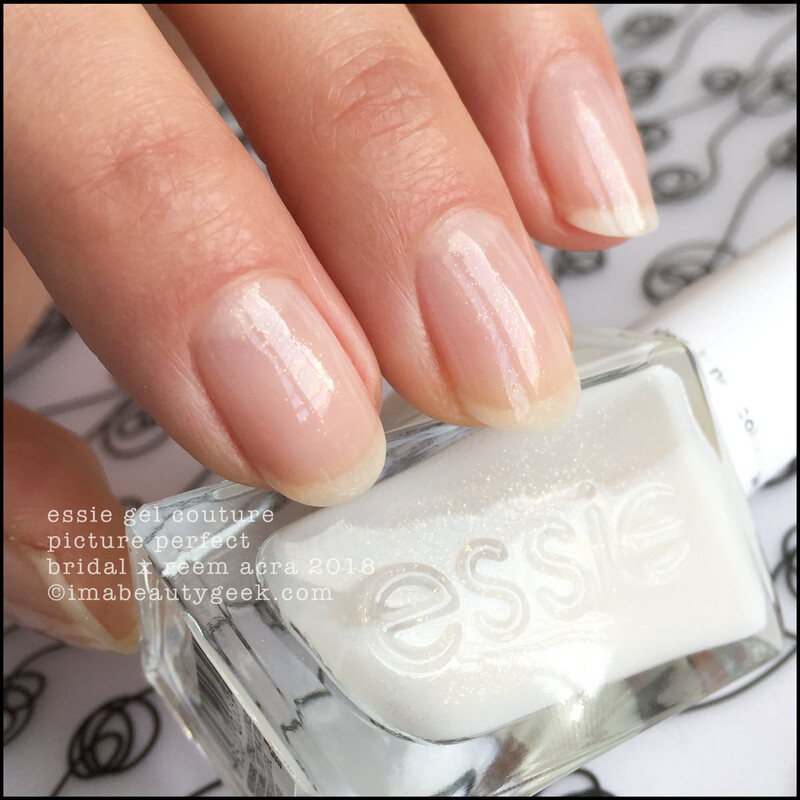 Essie Moments to Mrs Gel Couture – Essie Bridal 2018 (above). That’s a single coat and yes, I sorta flooded on my index finger but if you don’t look right at it, you’ll hardly even notice! (okay, yes – looking at that makes me crazy). It’s a lovely sheer that seems to be heading right into indie territory. Lookit them little flakies! It’s darling, right? 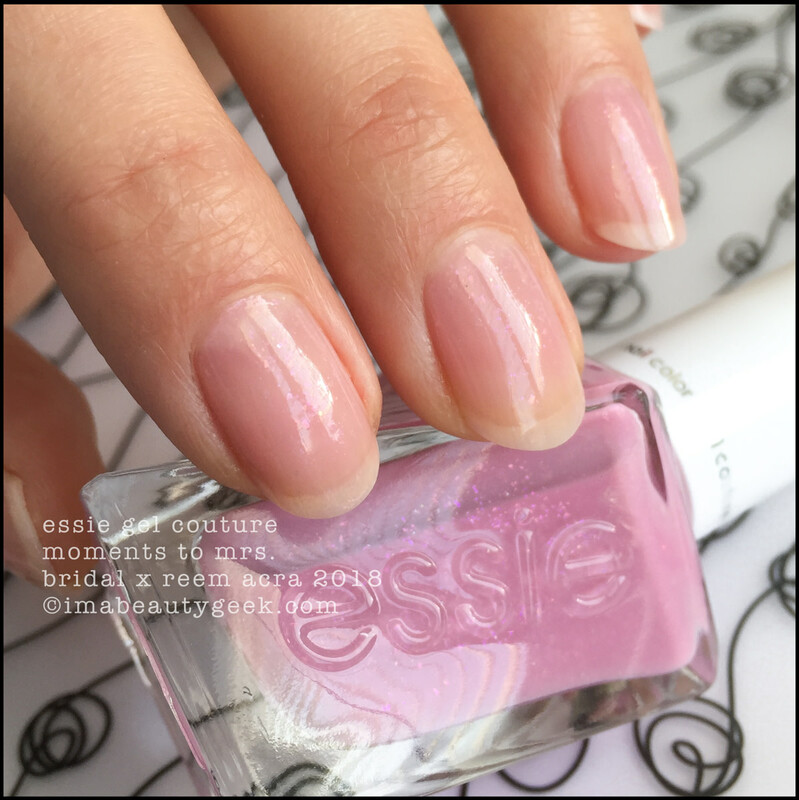 Essie Moments to Mrs. Gel Couture – Essie Wedding 2018 (above). And there’s a second coat. Like this, it&apos;s even more darling! I think I prefer 2 coats but I can totally see some people rolling with one. It’s just so sweet, charming, and has flakie goodness! 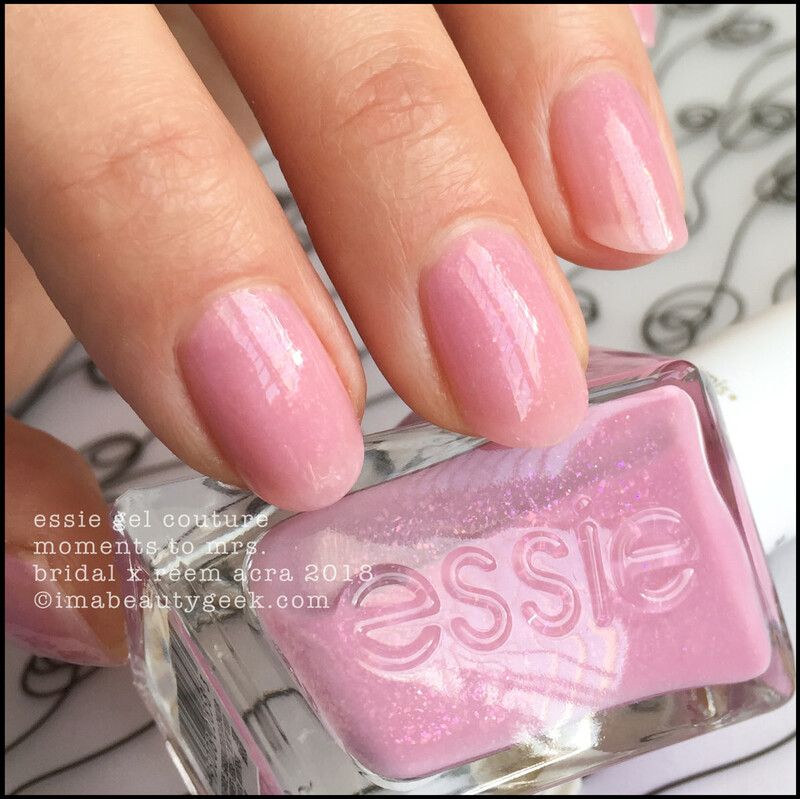 Essie Handmade of Honor Gel Couture – Essie Bridal 2018 (above). She’s a rosy champagne shade of metallic beauty. That’s a whack of a single coat and you’ll want to load your brush just right, use as few strokes as possible, and work quickly because she dries fast and she dries satin chrome. 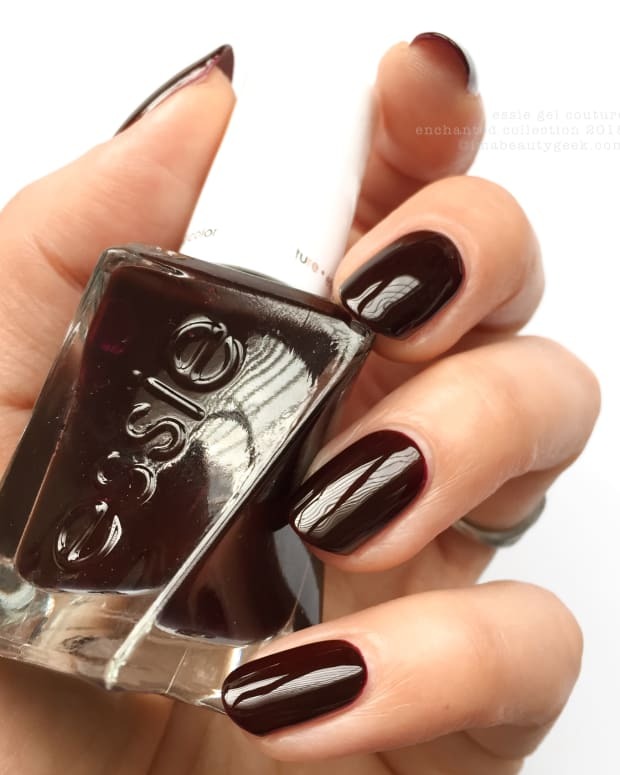 You can add top coat but why would you? She’s perfect just like that. 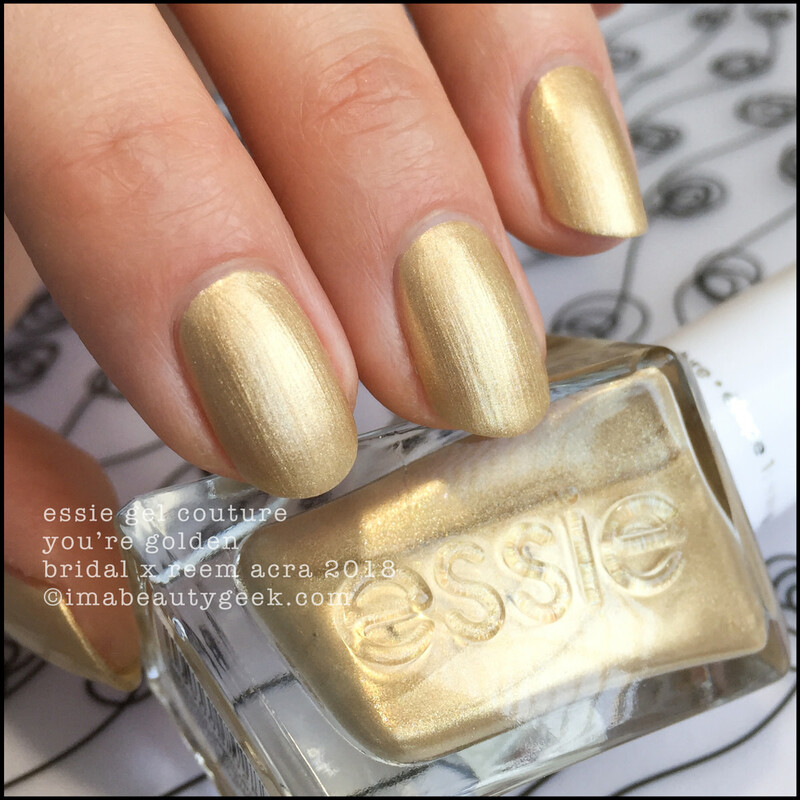 Essie You’re Golden Gel Couture – Essie Bridal 2018 (above). The other satin metallic in this collection also dries down with streaks that to me, makes it rather imperfect for a wedding day. Application is much the same as Handmade of Honor, and if you can get it on in a single coat, that’s best. If you can’t, then wait for the first coat to dry down before hitting it with the second – that way you reduce your odds of balding and you’ll also reduce the streaks. 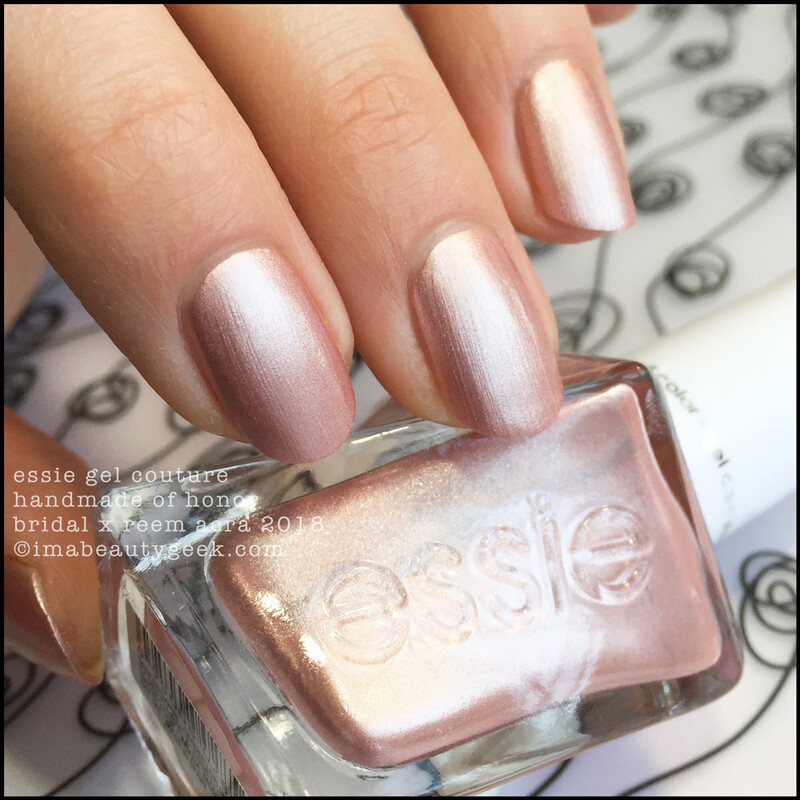 Essie Getting Intricate Gel Couture – Essie Bridal 2018 (above). And lastly, something blue. And it’s a good pastel blue that goes on like buttah in 2 smashingly easy coats. If I had to pick a shade that I’d layer that flecky golden Picture Perfect over, this one would be the one! And that’s it friends! 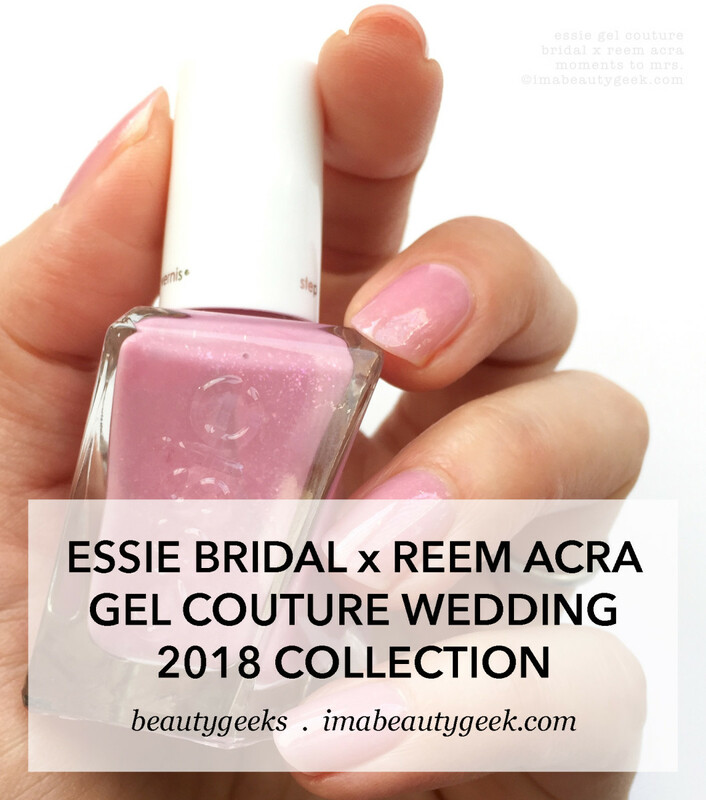 Essie Wedding 2018 Gel Couture x Reem Acra! I’m not sure what the actual release date is but I do know that you can get it in some places (in the US) right now. Do I know which places? Nope – all I know is I’ve seen it pop up in my IG feed. No. Just no. It&apos;s called Copyright Infringement and is against the law. Who loves HER nails?? Seriously? How DARE she crop out the watermark and then claim MY nails as her own. If you see stuff like this, please do keep sending the links to Janine or me. We ❤️ you for it!